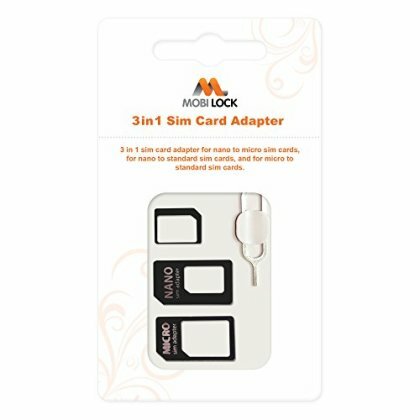 Mobi LockTM SIM card adapter helps you convert a Nano Sim to Micro Sim using a nano sim adapter to micro sim or a Nano sim to standard SIM card, and a Micro SIM card into a standard SIM card using the micro sim to standard sim adapter. The Sim to Micro sim adapter or Micro Sim Adapter Tray uses a Nano Sim Card which fits perfectly inside the tray. The Nano Sim card adapter is fully reversible, very easy to switch between cellphones, tablets and other devices. Phones that use nano sim cards like the latest iPhones can also use Sim Adapter Nano to Standard or Nano to Micro Sim Tray if they want to switch to other devices with Micro or Standard Sim Cards. Then the Standard Sim Adapter Tray is mostly used in standard sim card phones or older phones like the iPhone 3GS, iPhone 3, etc. The micro sim card adapter kit is machine carved with precise design to fit perfectly on devices and pre-cut manufacturer SIM cards. Nano sim card adapter for iphone is also compatible for other devices. Enjoy using Sim card adapters on all your different devices without hassle when installing them. The Nano Sim card adapter is easy to install. No other tools are required. The Nano sim to micro sim card adapter is what you need if you have a Nano sim and want to use it to a Micro sim supported device. It is strongly recommended that you use your Mobi LockTM SIM card adapter always with a pre-cut manufacturer SIM cards. The Nano simcard is smaller than Micro sim and Nano sim adapter, allows the Nano sim to be used with a micro sim or standard sim device. The Phone sim card adapter does not need extra tape to hold the sim card and the sim card can only be converted into a larger physical size, and not a smaller size.